Two Presentations in One Week! English degrees don't typically involve a lot of presentations. I think I could count the number of in-front-of-the-class presentations I gave during my undergrad on one hand — and most of them were in foreign language classes. Suffice it to say I've never delivered any comprehensive slideshow presentations, and no presentations at all for many years. But last week, I gave two. 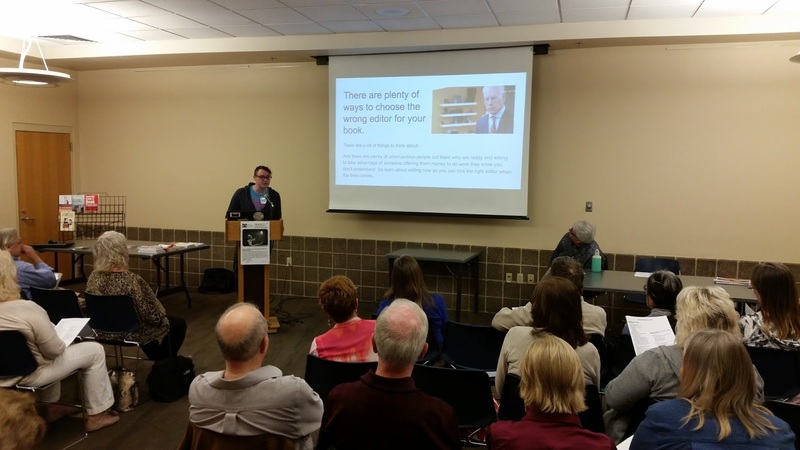 The first, on Wednesday, was part of an Author Resources Guide organized by Kevin Ericson for the St. Louis Publishers Association (SLPA). It had an attendance of about fifty and a panel of myself, book designer Peggy Nehman, and author and book marketing whiz Bob Baker. I presented a rush of resources for the audience, over forty slides in under 20 minutes. Whew! Why you need to edit. How to find good editors. How to work well with editors. How to edit your own writing. I think I did okay! At least I didn't melt down, and if I let loose any spoonerisms, I didn't hear myself and no one pointed it out! 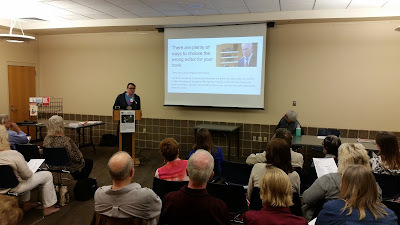 It was encouraging to feel confident enough in the thoroughness of my editing style sheets, practices, experience, and mental notes that I felt competent enough to present and answer questions. And I met a lot of great people through it! Many thanks to the SLPA for putting on these two great events. Both slideshows will be available to SLPA members on the SLPA website. I heard a lot of interesting questions from people in unique publishing situations, and I loved putting my mind to work and pondering over good solutions with with the other panel members. I loved it so much I want to do it some more! So please, post some questions in the comments below! What do you want to know?